Spring Crappie fishing can be fun and exciting. Fast-paced as the water begins to warm and the Crappie begin to feed heavily. Many Anglers will load the boat with average-sized Crappie and be happy with a limit and diner. Other Crappie Anglers are looking to land a few “Slab” sized Crappie, those that are larger than average, for that body of water. 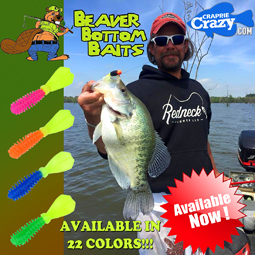 We tell you how to find and land those “Slab” Crappie NOW! Sunny Spring days give way to warmer water temperatures with shallow water warming first. Male Crappie will begin to move into shallow bays and shorelines as the water temperatures reach into the to 50 degree to mid 50 degree range. Not only are they actively feeding but are anticipating the Spring Spawn. This is a great time to fill the boat with average sized Crappie. Tossing a minnow or jig under a bobber at the 2-4 foot range will do the trick. But what about the bigger fish? To find “Slab” sized Crappie you must first realize that you will be targeting female Crappie. Female Crappie are loaded with eggs this time of year and are waiting for the shallow water temperatures to rise. Like most females, they have the mind of their own, total separate of male Crappie. They will go shallow when water temperatures begin to hit the 60 degree mark. Much later than male Crappie. In order to catch these “Slabs” you will have to back off of the banks. Find the secondary drop off usually a channel break or ledge. These female Crappie will hold up on these secondary drop offs staying close to stumps, brush piles, trees or any object that will provide sufficient cover. To catch these “Slabs” will require a different approach. Position your boat in the channel. With a 1/16 or 1/8 ounce jig tipped with your favorite plastic cast toward the bank and allow your jig to sink to the bottom. Watch your line at all times taking notice of any line twitch. You will then want to lift your rod tip from 10 o’clock to 12 o’clock and then back to the 10 o’clock position as you reel in the line slack. Your jig will then sink back to the bottom. Repeat this until your jig is almost directly under the boat. This is called casting with a yo-yo retrieve. Tip: It is extremely important to watch your line at all times. Some days Crappie prefer a falling jig (vertical movement) while other days they will hit a moving jig (horizontal movement). Clear Water: Clear water will often require a realistic plastic or natural look. Use a jig head that is pushed into the plastic body. 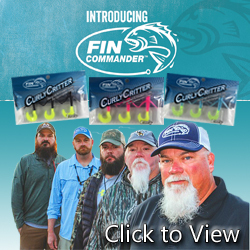 Shad bodied plastics or curly tail grubs are a great choice in natural colors. Stained/Dingy Water: Stained or Dingy water will require more vibration. Crappie will key in on the vibration before they actually see the jig. A bladed jig head with a shad body or curly tail grub is a great option. The more vibration you can get from the plastic the better your chance of a “Slab” finding it. While it is extremely fun to catch these Spring time “Slabs”, it is also important to RELEASE them to spawn. Most female Crappie will lay on average 40,000 to 80,000 eggs but some can lay upwards of 100,000 plus depending on their size and age. Now, times that by a limit and a single angler can put a hurt on a growing Crappie fishery. Spring Crappie fishing can be fast, fun and exciting catching average-sized Crappie. But for those who are looking for “Slabs” take note and try these simple but effective tips and techniques for Spring time “Slabs”.